WASHINGTON — Fears of espionage have driven the U.S. government from New York’s famed Waldorf-Astoria Hotel, which has housed presidents and other top American officials for decades but was bought last year by a Chinese firm from Hilton Worldwide. Instead, President Barack Obama, his top aides and staff along with the sizable diplomatic contingent who trek to Manhattan every September for the annual U.N. General Assembly will work and stay at the New York Palace Hotel, the White House and State Department said. The Associated Press first reported the impending move in June but it wasn’t formally announced until Friday, a day after the final contract was signed with the Palace. Officials said the change is due in large part to concerns about Chinese espionage, although White House and State Department spokesmen said the decision was based on several considerations, including space, costs and security. “While I don’t have the details on the specific arrangement that’s in place for the president’s trip to New York in a couple of weeks, I can confirm the report that president will stay and the rest of the US delegation will stay at the New York Palace Hotel,” White House spokesman Josh Earnest told reporters. The hotel has served as the home of the ambassador to the UN since 1947 and presidents and other top officials have traditionally used the Waldorf for decades. U.S. law allows the department to rent the ambassador’s residence for a term of 10 years or less. The current lease expires next year with an option to renew for one or two years. 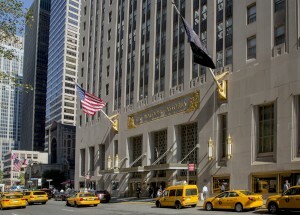 U.S. officials have pointed to Hilton’s sale of the Waldorf-Astoria to China’s Beijing-based Anbang Insurance Group for $1.95 billion last year as having prompted the security concerns and on recent overnight trips to New York, Obama, Vice President Joe Biden and Secretary of State John Kerry have all shunned the Waldorf for other hotels. It was not immediately clear if U.S. officials would be barred from meeting with foreign dignitaries at the Waldorf, which will continue to host non-U.S. delegations. However, an early version of Kerry’s schedule for this year’s General Assembly shows him with no meetings at the Waldorf. Terms of the sale allow Hilton to run Waldorf for the next 100 years but also call for “a major renovation” that officials say has raised eyebrows in Washington, where fears of Chinese eavesdropping and cyberespionage run high. The U.S. suspects China-linked hackers were behind a recent massive breach of federal personnel records that compromised the data of millions of government workers. At the time of the October 2014 sale, officials said it could have implications for the U.S. government’s longstanding relationship with the hotel. They said decisions about the relationship would be made on cost, Anbang’s plans for the property, and security concerns with an eye on the renovation project. The State Department routinely warns U.S. diplomats in China about physical and electronic surveillance and tells American citizens in the country to be aware of similar risks, notably in hotels. “Hotel rooms (including meeting rooms), offices, cars, taxis, telephones, Internet usage and fax machines may be monitored onsite or remotely, and personal possessions in hotel rooms, including computers, may be searched without your consent or knowledge,” the department’s travel advice for China says. “Business travelers should be particularly mindful that trade secrets, negotiating positions and other business-sensitive information may be taken and shared with local interests,” it says. The New York Palace hotel is owned by South Korean investors.